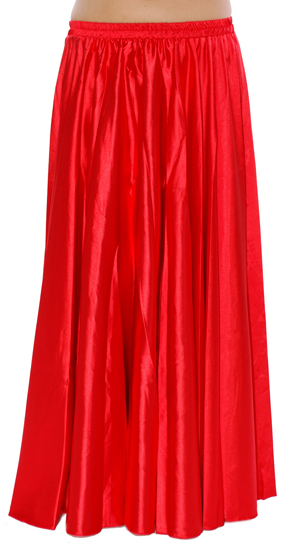 Shimmering, glamorous, and comfortable, this full circle satin polyester skirt is suitable for all styles of belly dance. 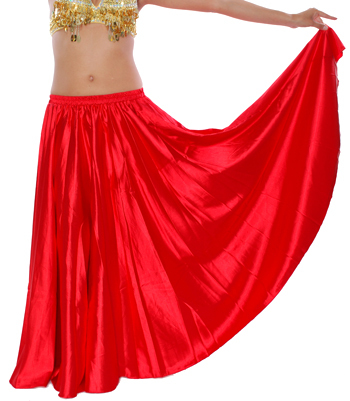 Shimmering, glamorous, and comfortable, this full circle red satin polyester skirt is suitable for all styles of belly dance. A perfect staple for your belly dance costume wardrobe! Waistband / Upper hip: 26 - 42 inches; Length: 38 inches. It is a pretty shade of red and goes well with the rest of the outfit. I have two satin skirts - one red, one white - and I love them. They work wonderful with my other bedlahs, plus they are so comfortable and yet look so expensive. We ordered two of these skirts one red the other purple. They are for a specialty classical dance so the look and flow of the material is important The color was right on from the charts and the skirts flow is beautiful. We ae pleased.